PARKING: Designated accessible parking throughout parking areas. Width of parking space 8-ft., width of accessible aisles 5-ft. Ramps near accessible parking space. Dowload parking map in PDF format. Link to disabled parking access information. Link to live parking status. ENTRANCE: Ramps are provided. Automatic doors, 36-in. Wide. FACILITIES: Signage is printed in contrasting colors. Elevator is wheelchair accessible with sound indicator. Lowered drinking fountains. PUBLIC REST ROOMS: Located throughout. No steps. Doors are 36-in. wide, open in/out. Not turns to enter. Accessible stalls have 32-in. wide doors opening in, handrails. 19-in. toilet seat height, 12-in. between commode and wall. Sink height 34-in. Airport has companion toilets on all concourses. Link to animal relief areas. FOOD AND BEVERAGE: Located throughout. Tables are 30-in. high. Menus are printed on non-glossy surface. Link to dining directory. GIFT SHOP: Aisles are 44-in. wide, and counters are 35-in. height. Clerks assist customers with special needs. Aisles clear of temporary displays. Link to shopping directory. PROCEDURES: Each airline has procedures for tickets, luggage, boarding and exiting and wheelchairs available for persons with mobility disabilities. Skycaps are available for assistance. 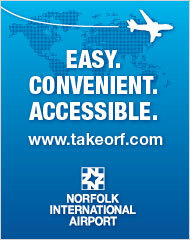 Wheelchair lifts for commuter aircraft and at stairways to hold rooms. 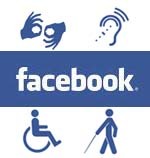 Link to services for persons with disabilities. 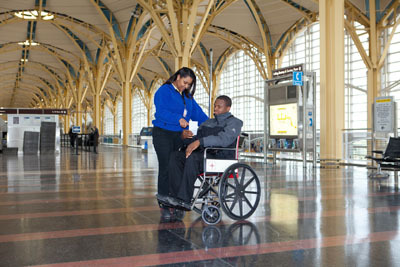 For persons with mobility disabilities: security checkpoints have special procedures for travelers in wheelchairs, and skycaps have access to areas restricted to general public for wheelchairs. For person with visual disabilities: loud speakers warn travelers of special security procedures, and skycaps can provide assistance. For persons with hearing disabilities: signs are posted conspicuously around security points to ease travels. Link to the TSA for latest security regulation updates. ADDITIONAL INFORMATION: Airport has non-smoking areas available. Luggage handling is also available. Free Wi-Fi link. Download terminal map in PDF format. Link to shopping and dining maps.